One of the problems in a league that everyone seems to know how it’s going to end is maintaining interest during the regular season, which everyone thinks is too long. The solution for neutral fans, or those who support teams that aren’t gonna come close to winning anything in 2018, is to focus on the fun. You know, something that Damian Lillard is all about. Without blowing things up, the Portland Trail Blazers aren’t going to win a championship, more likely than not, although they might be able to free up the salary cap jam they’ve gotten themselves into over the last few years. However, sometimes just being competitive, and creating a playoff tradition, is good enough. That tradition was on hold for a few years for the Blazers, until the arrival of Lillard. The All-Star point guard, like a lot of other players this season, made into a personal mission to make life miserable for Lonzo Ball, who made the wrong kind of headlines by scoring 0 points. The fact that the Lakers were +10 during his is something most people ignored. Lillard (+6 for those who care) carried on his hot streak, scoring 32 points, making it 3 games in a row over 30. 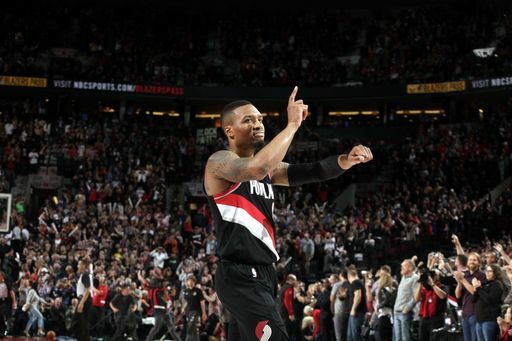 Most importantly, he nailed the game winning shot, putting the Blazers over .500 once again. Lillard is averaging 26.1 points, 5.9 assists and 5.4 rebounds per game this season, and while his shooting was a bit iffy in the first few games, he’s been shooting much better over the last few games. The Blazers in general haven’t changed much. This is Lillard & McCollum’s team, with a weak bench, and Jusuf Nurkic giving them an offensive low post presence that’s been missing. The Warriors, unlike the Cavaliers, are in no-panic mode. Their 20-point win in San Antonio and 28-point demolition at the Clippers suggests that there’s nothing new under the sun in the Western conference – not really. There’s plenty of good basketball to see in the NBA – Philadelphia, Memphis, Boston, Indiana, Minnesota and Utah. Even bad teams have their knights in shining armor, like Lauri Markkanen shutting up Bulls fans who thought he was a terrible pick back in the summer by being the only thing worth watching on an awful team. It’s still probably going to be the Warriors vs someone in the East (we’re no longer sure about who), but if you shut off that part of your brain that only cares about winning rings, it’s going to be a fun season.